Cutting board Safety sign Choose the size you're after and polypropylene for food grade safety. 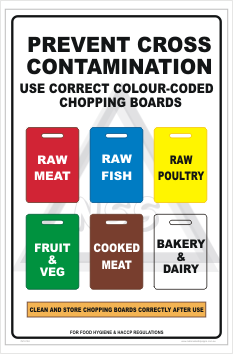 Our Cutting board Safety sign showing all the colours and what foods can be cut up on them. These signs are available in food grade polypropylene as well as stickers. Go HERE to see all the main Kitchen signs.